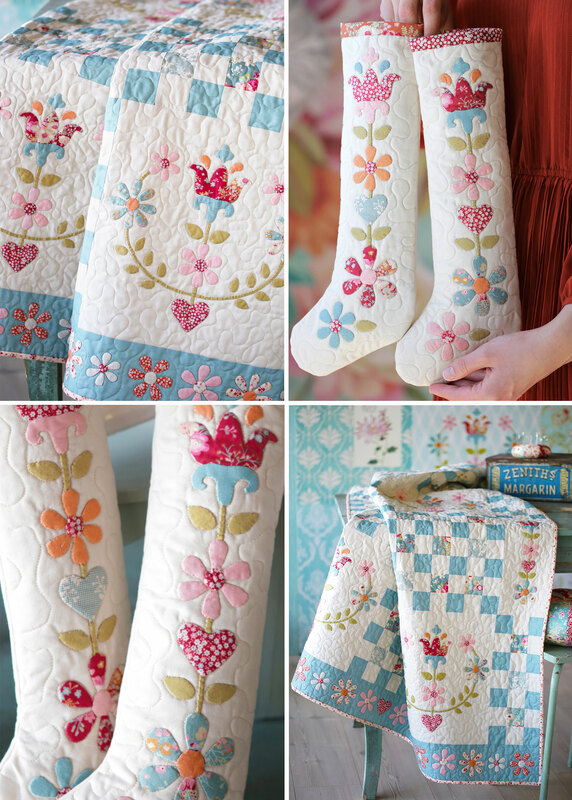 You might have seen the new products called “Paper Piece Appliqué” among the Tilda news this autumn. Many of you know about freezer paper appliqué, and this is kind of the same technique except the paper pieces are pre cut witch will save you a lot of work. There are two different designs, and each package contains nearly 200 pieces so that you are able to make many different motifs. Place the card template on the fabric. Cut about 0,25-0,3 in outside the edge of the template for small pieces and 0,4 in for larger once. When using very small pieces make sure the edge of the fabric is not too large to be folded around the template. 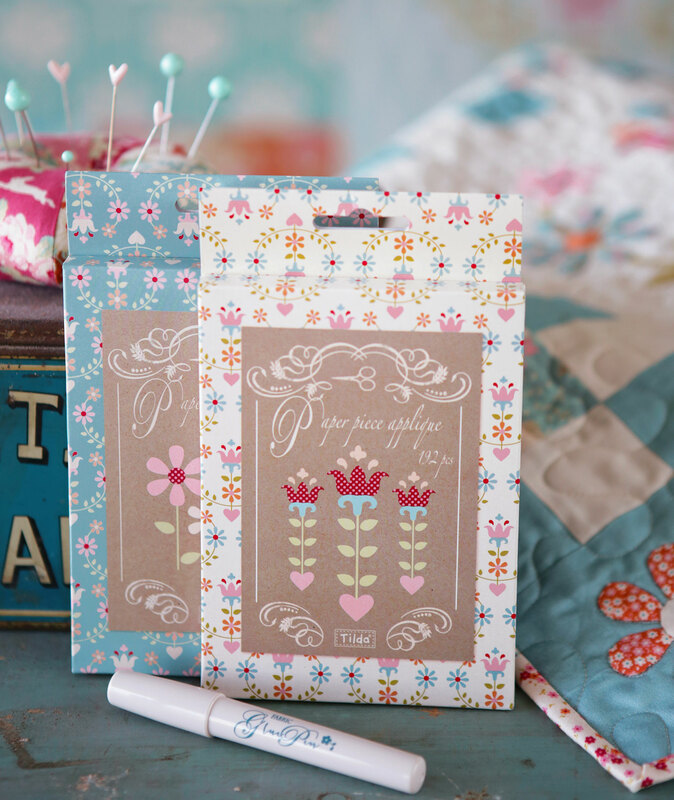 Place the card template against the wrong side of the fabric piece. Spread glue along the edge of the template. Try to avoid getting glue on the edge. Fold the fabric around the edge of the template, see figure A. On small pieces it might be easier to use a flower stick or the like instead of your fingers. If you want to use stems or branches in your design cut strips slightly less than 3 times as wide as you want the finished stem/branch to be. Spread Paper Piece glue all over the wrong side of the strip. Fold the edges in towards the middle, first one side, then the other. See figure B. Place the stem/branch and your fabric covered paper pieces on the background fabric and adjust until you are satisfied. Use paper piece glue to attach the pieces. Sew the branches/stems and fabric covered pieces on to the background fabric using small “invisible” stitches around the edge. Try not to sew trough the templates. Then cut trough the background fabric from the back and coax out the card pieces. See figure C. It can be helpful to use tweezers to get the small pieces out. If the cut-up edges on the back refuse to sit smoothly, you can glue them towards the middle of the applique with some Paper Piece glue. 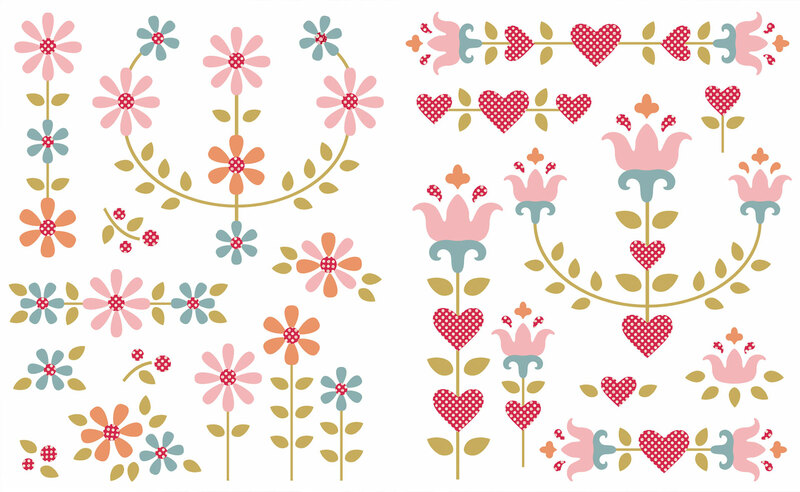 Here are some examples of how you can put the pieces from the two different designs together to create different motifs. And here is what you can make! We have used both designs in the same motifs. This is fun, easy and requires no talent for appliqué techniques.